Ruddy ducks often hold their tails upright while resting. Situated between the Appalachian Mountains and the Atlantic Ocean, South Carolina offers great duck-viewing opportunities during the state’s mild winters. More than 20 species pass through the state between September and March, while one resident species never leaves. Ornithologists divide these species into five primary groups: dabbling ducks, perching ducks and three types of diving ducks -- sea ducks, bay ducks and stiff-tailed ducks. The dabbling ducks -- also known as puddle ducks -- get their name from their habit of “upending” when feeding. Some of the most common species in this group include the familiar mallard, the green- and blue-winged teals, northern shoveler, northern pintail, American widgeon and gadwall. Most of the dabbling ducks arrive in South Carolina during October; however, blue-winged teals visit briefly in September, while mallards and black ducks do not arrive until December. Dabbling ducks exhibit a variety of feeding patterns and rely on different food sources from each other; so many species often share the same area. As their name indicates, perching ducks nest and roost in trees. These species retain the webbed feet of their relatives and are capable swimmers, but their feet bear three small claws, which help them to climb. Wood ducks are the state’s only perching duck species, as well as the state’s only year-round resident, but they are often grouped with the dabbling ducks because of their similar feeding behaviors. When not feeding in the water, wood ducks collect acorns and berries from the forest floor. Black scoters, surf scoters, buffleheads, goldeneyes, common eiders, harlequin, long-tailed ducks and mergansers comprise the sea duck clade. Buffleheads and goldeneyes are closely related species that bear large, flamboyant heads. Mergansers are predatory diving ducks that catch crayfish, insects and fish with their serrated bills. Sea ducks are the most accomplished divers among all ducks, and they often dive to depths of 65 feet. Some species, such as long-tailed ducks, are capable of diving even deeper. Common bay ducks -- also called pochards -- in South Carolina include canvasbacks, redheads, lesser scaups, greater scaups and ring-necked ducks. Like those of all other diving ducks, the legs of bay ducks are situated at the back of the ducks’ bodies, rather than in the middle, as with dabbling ducks. Lesser scaups are one of the most common ducks in South Carolina. Unlike their close relatives (the greater scaups), lesser scaups prefer fresh water. The handsome redhead ducks exhibit an unusual egg laying behavior -- rather than constructing their own nests, they often deposit eggs in the nests of other ducks. Ruddy ducks are the only stiff-tailed ducks to inhabit South Carolina. The males of this stocky species have pale blue bills, brown bodies and conspicuous white cheek patches. 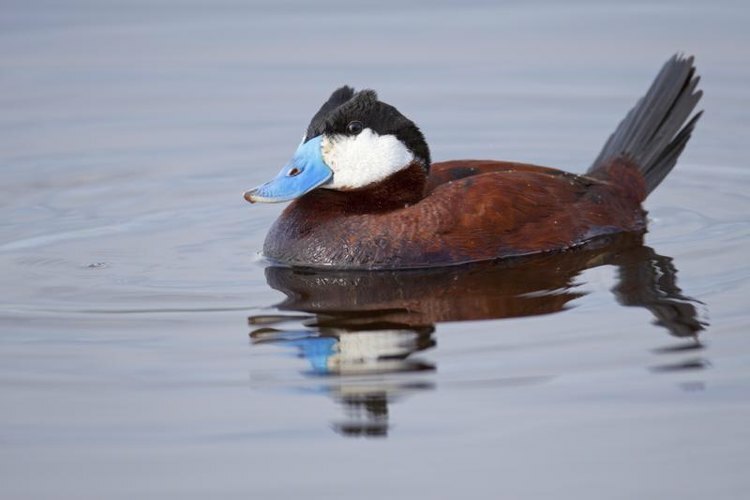 Ruddy ducks arrive in South Carolina in December and stay until March. Most of their feeding takes place during the night, as they forage for underwater insect larvae.